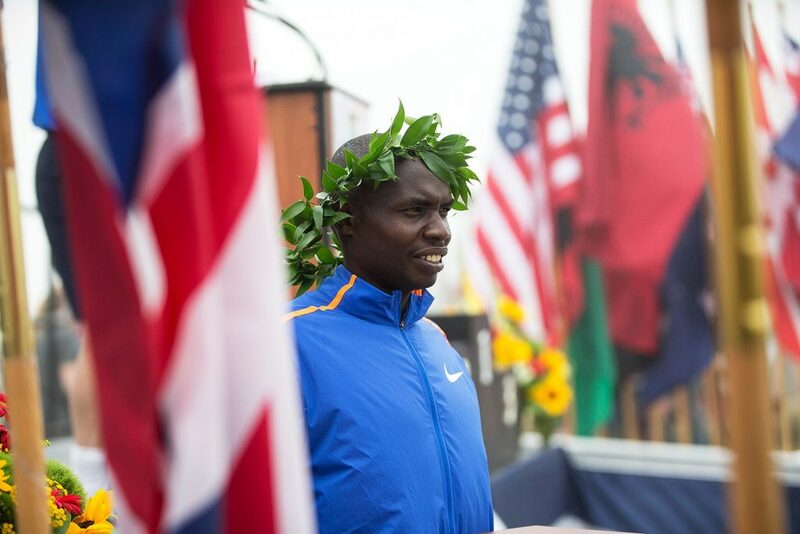 Stephen Kosgei Kibet, of Kenya, stands on stage after receiving his award for a first-place finish at the TD Beach to Beacon 10K road race. 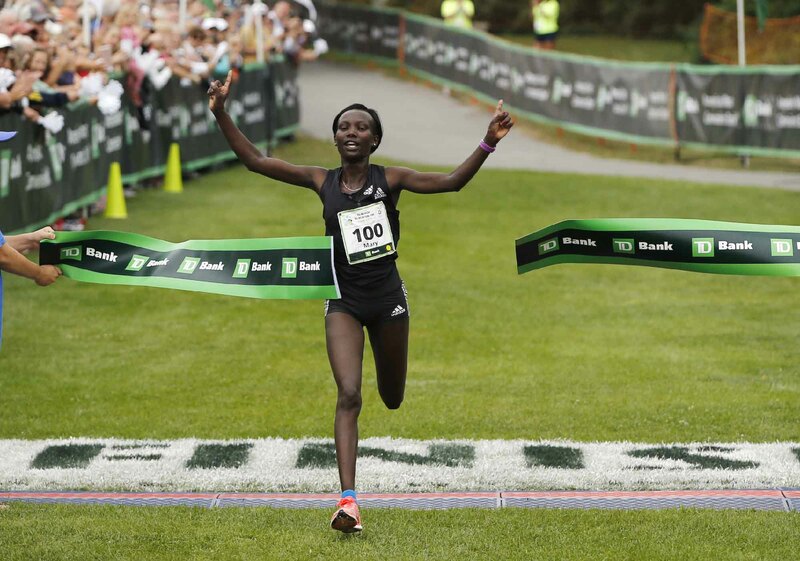 Mary Keitany, of Kenya, crosses the finish line in 30 minutes, 41 seconds to win the women's race at the TD Beach to Beacon 10K road race in Cape Elizabeth on Saturday. 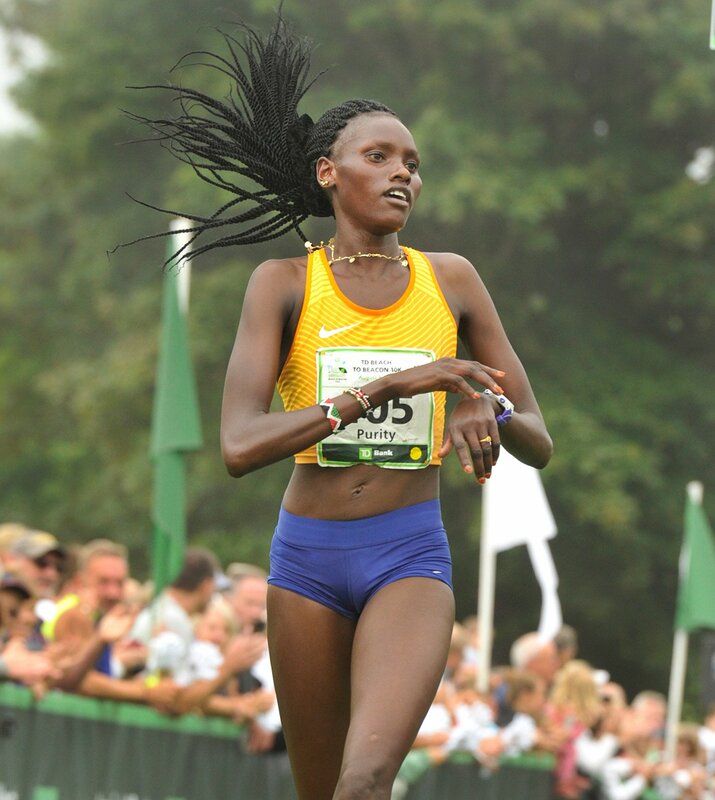 Mary Keitany, of Kenya, takes the top spot on the podium after finishing first among the women at the TD Beach to Beacon 10K road race. At left is second-place finisher Purity Rionoripo.  Meseret Defar-Tola finished third. 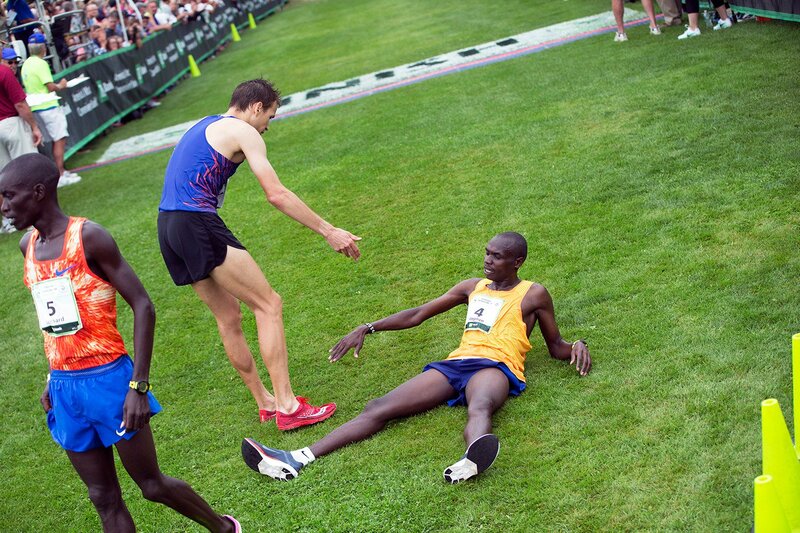 Second-place finisher Ben True leads over to shake hands with Stephen Kosgei Kibet, who dropped to the ground shortly after winning the race. Third-place finisher Leonard Kiplimo-Barsoton, of Kenya, is at left. 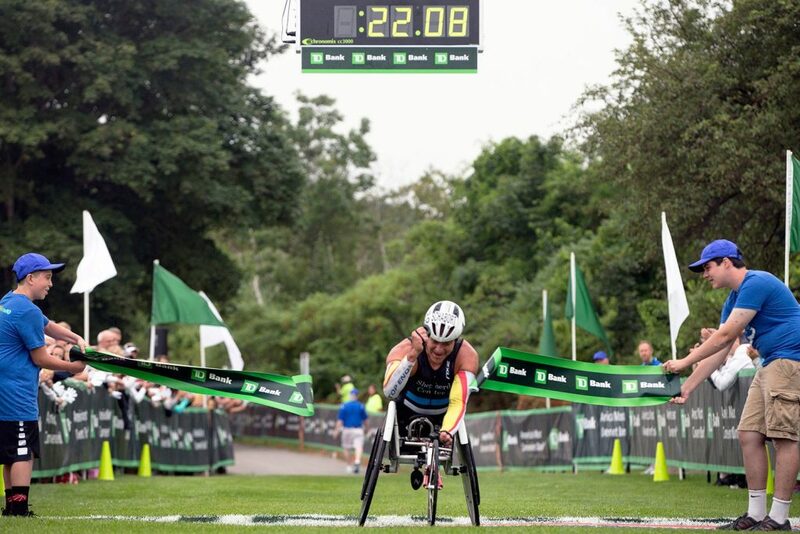 Krige Schabort, of Rome, Georgia, breaks the tape to finish first in the wheelchair division. 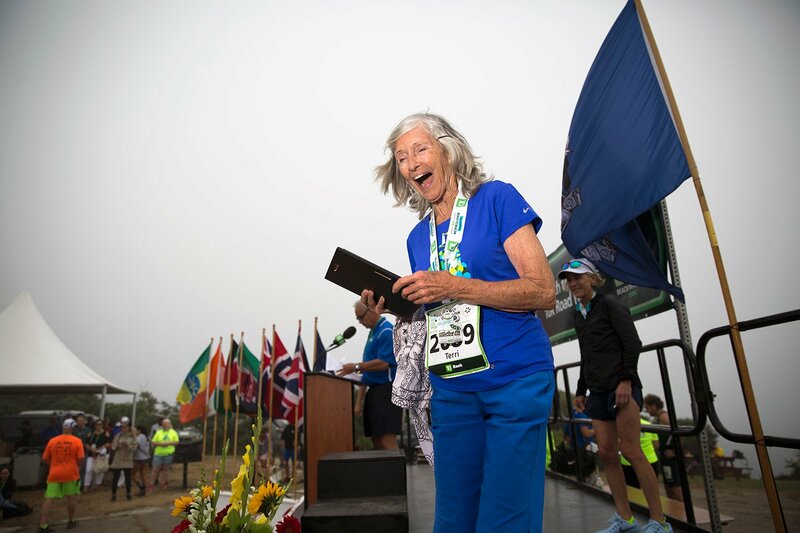 Joan Benoit Samuelson applauds during a winners' ceremony after the 20th running of the TD Beach to Beacon 10K road race. 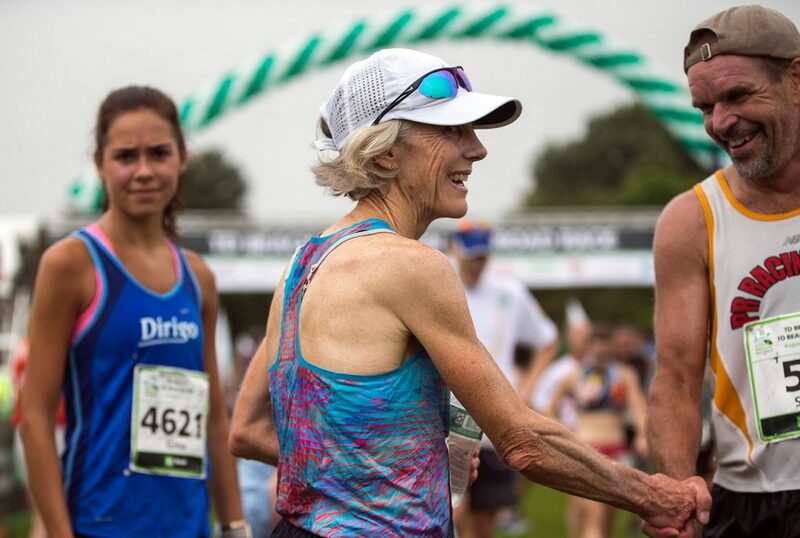 Samuelson, who founded the race, posted the fastest 10K race time for a woman 60 or older. Robert Gomez, #32, of Windham, helps Jesse Orach to the finish line after Orach had collapsed just before the line. Gomez' extraordinary act of sportsmanship gave Orach the extra help he needed to cross the line – and win his division. 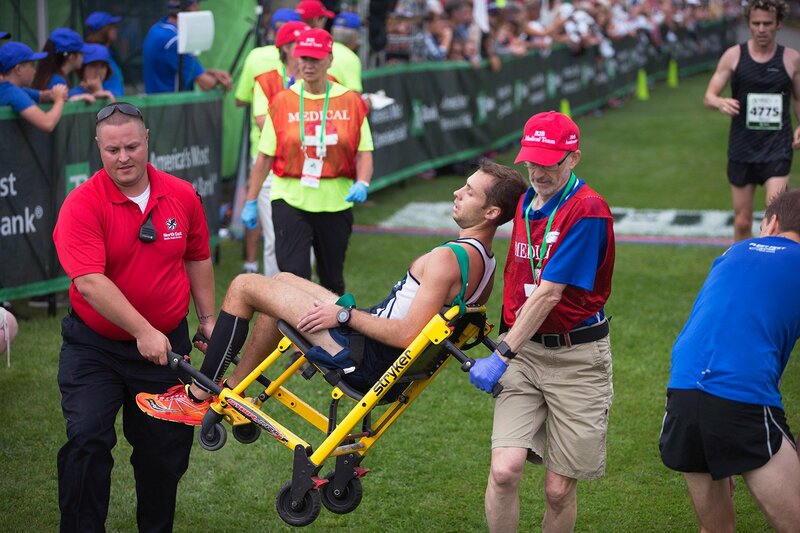 Medics carry Jesse Orach to a medical tent after the Gorham ressident collapsed at the finish line. Orach was the top Maine finisher. 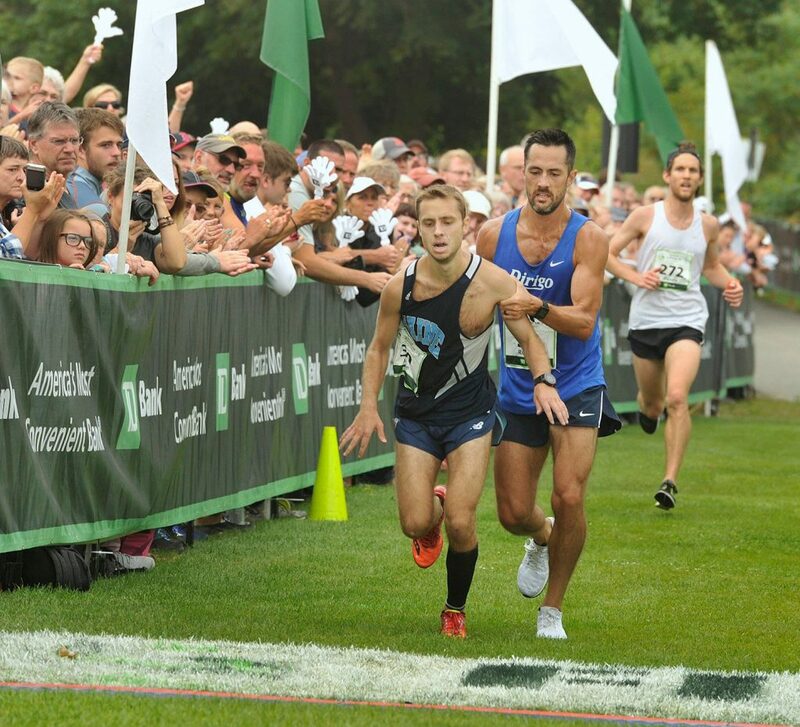 Jesse Orach, of Gorham, the top Maine finisher, points to Robert Gomez, of Windham, who helped him cross the line before Gomez finished second among the Maine men. 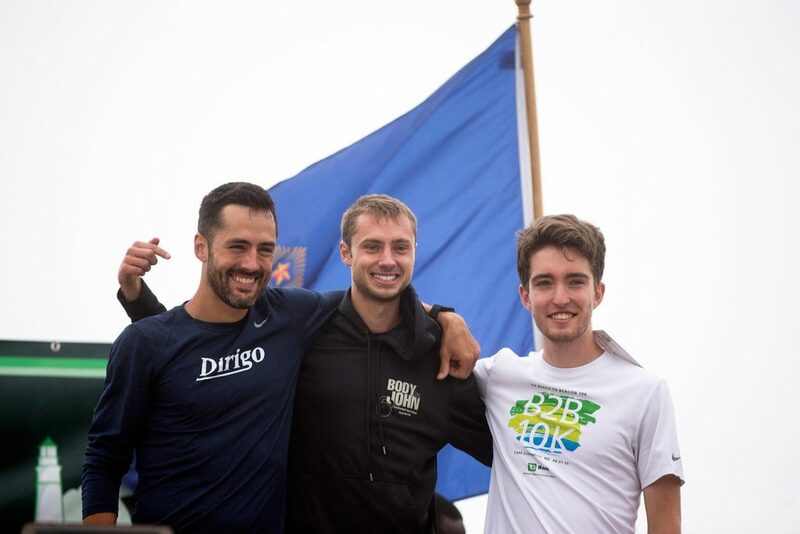 At right is the third-place finisher among the Mainers, Liam Simpson, of Cape ELizabeth. Terri Morris, 88, of Venice, Florida, celebrates after being presented an award from Joan Benoit Samuelson, right, for being the oldest finisher. Emily Durgin of Standish wins the Maine women's division for the first time, pulling away from defending champion Michelle Lilienthal in the final mile. 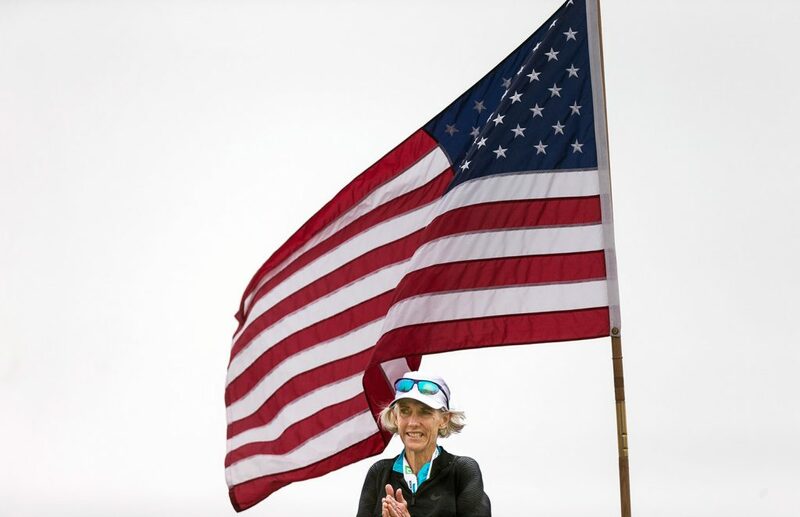 Race founder Joan Benoit Samuelson greets runners at the finish line during the TD Beach to Beacon 10K road race. 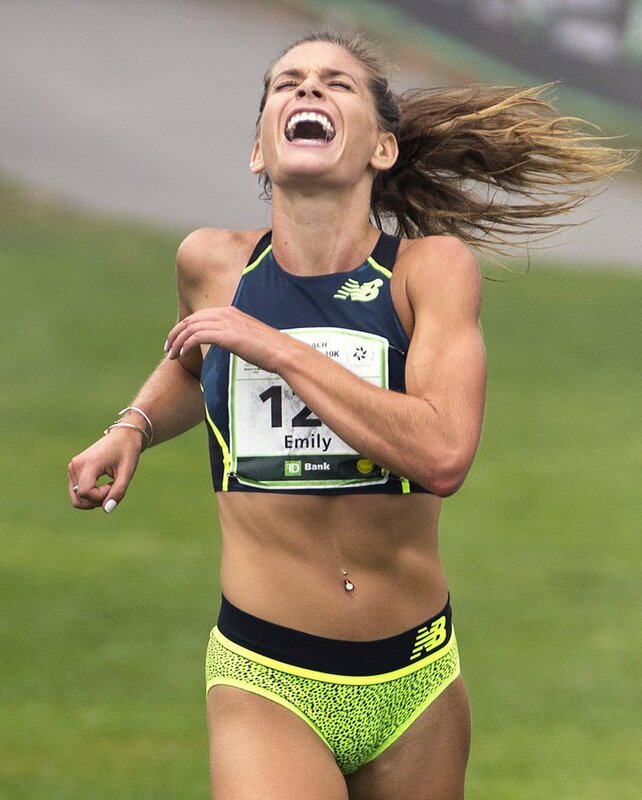 Minutes earlier, Samuelson posted the fastest 10K race time for a woman 60 or older. The field of runners pulls away from the starting line after the elite pack, their sheer numbers apparent in a sea of color. Nearly 6,500 competitors participated. 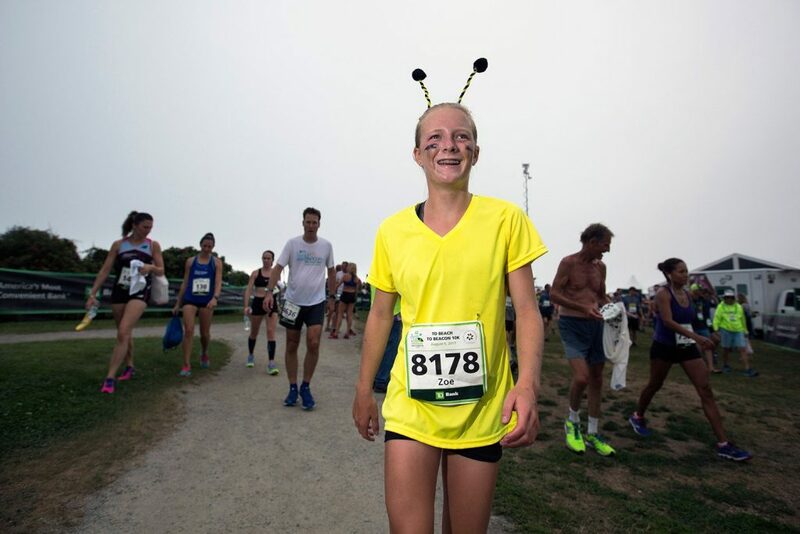 Zoe Evans, 14, of Cape Elizabeth sports a pair of bee antennae for the Beach to Beacon road race. Runners cool off under mist fans after running in the 20th Beach to Beacon. 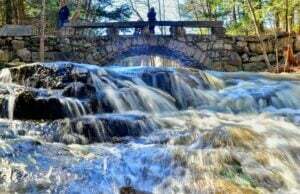 Conditions were cool but humid because of persistent fog. 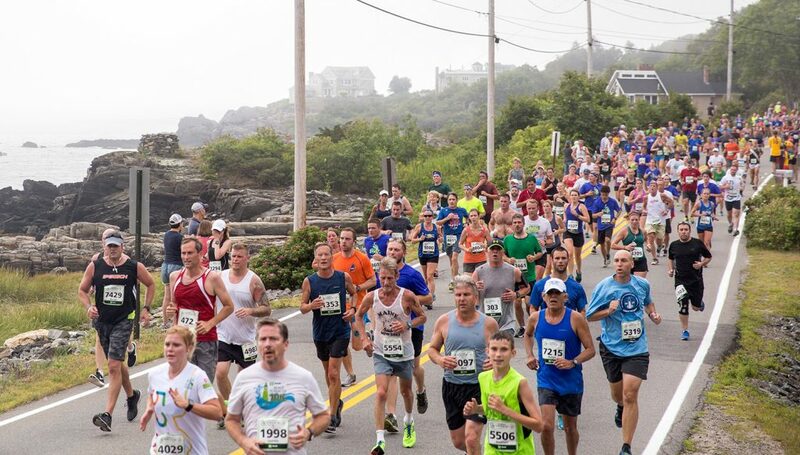 The elite runners set the pace at the start of the Beach to Beacon on Saturday. 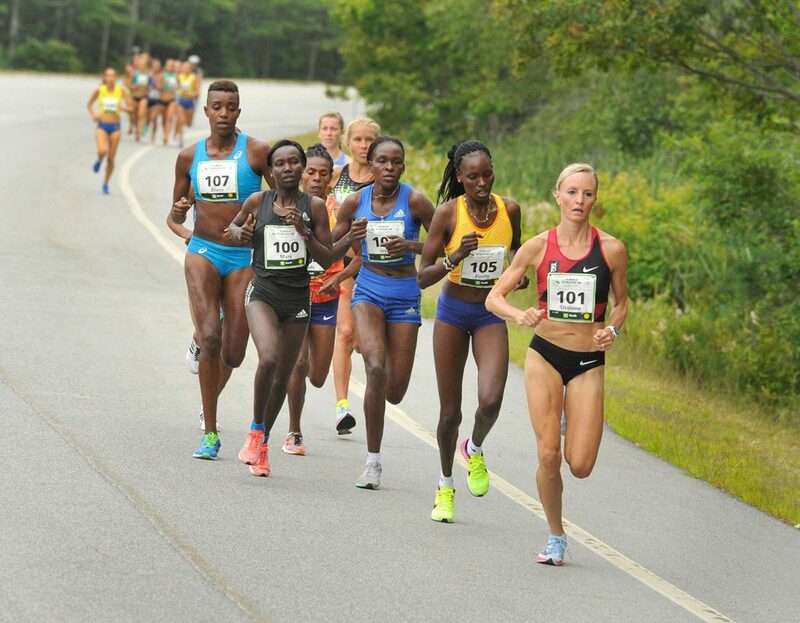 The top women are led by Shalane Flanagan, #101, as they begin to break away from the pack early in the race. Shalane Flanagan, the first American woman finisher, strides onto the stage Saturday during an awards ceremony in Fort WIlliams Park. 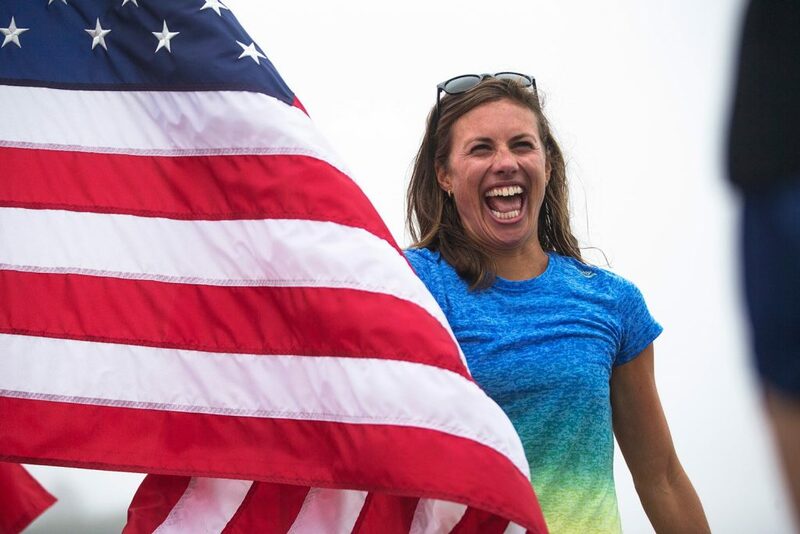 Michelle Lilienthal, of Portland, who was second among the female Maine finishers, beams after being called to the stage during an awards ceremony after the TD Beach to Beacon 10K. 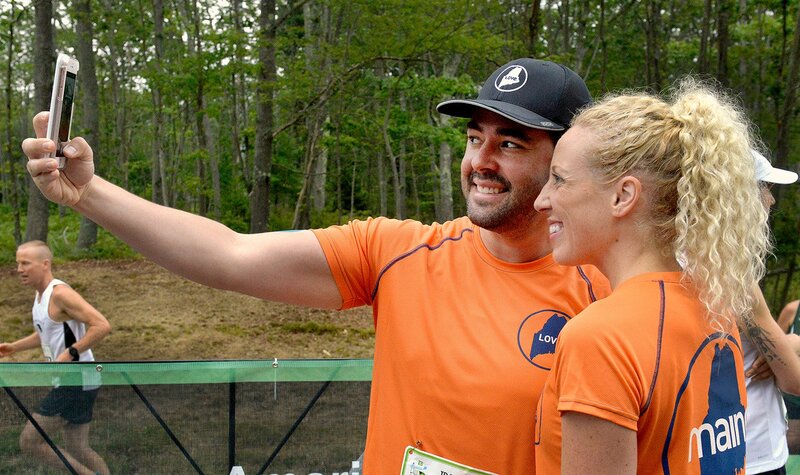 Joe and Margaret Ybarra, of South Portland, pose for a selfie before the start of the race. 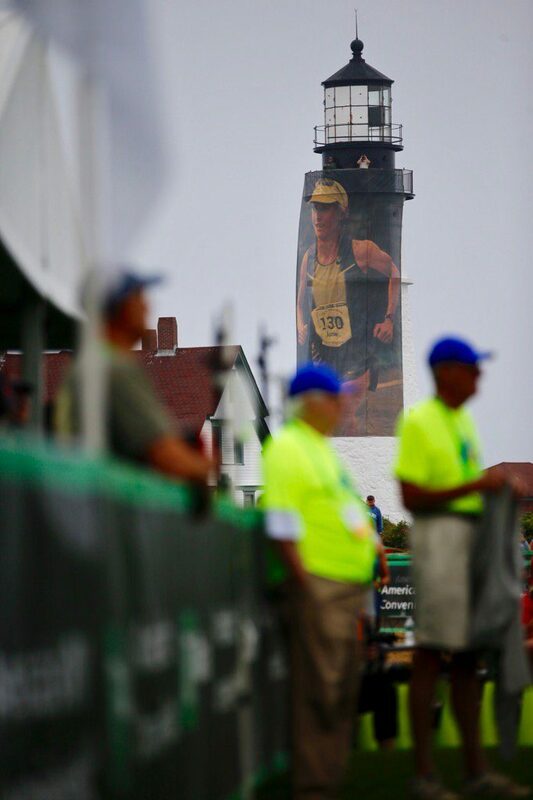 A giant banner of Joan Benoit Samuelson hangs from Portland Head Light near the finish line of the Beach to Beacon on Saturday. Kara Healey helps her husband, Ryan, stretch in the starting line area before the start of the TD Beach to Beacon 10K road race. 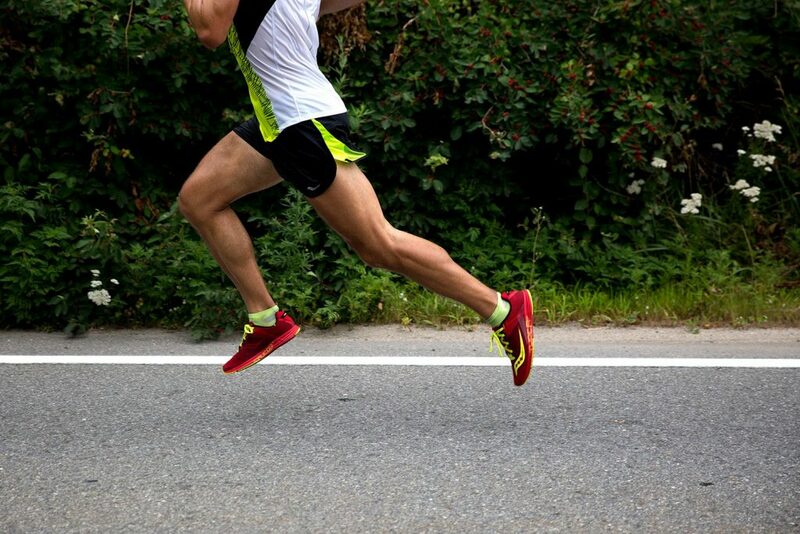 It was the first time the couple, from Massachusetts, have run the race. The field of runners pulls away from the starting line. 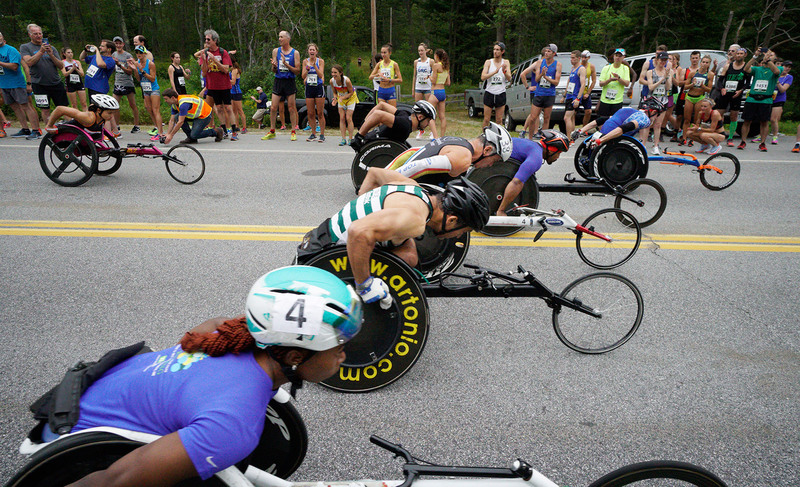 Wheelchair racers pull away from the starting line. A runner heads toward the five-mile marker. 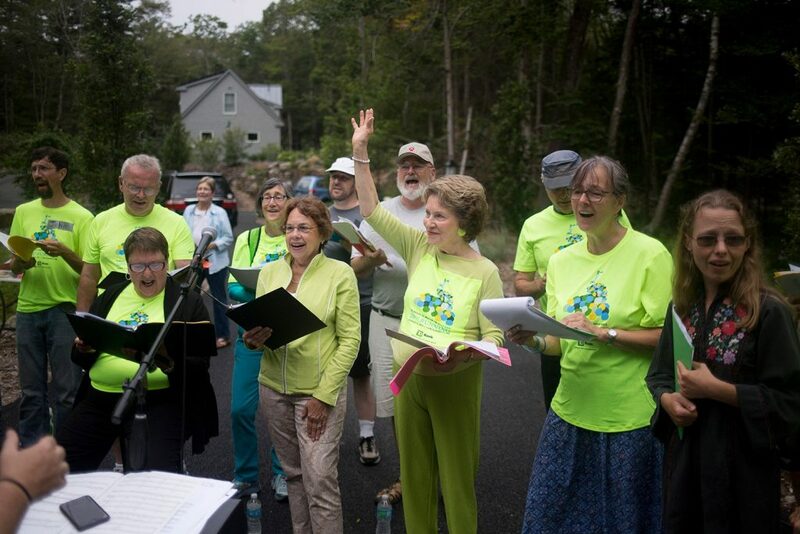 Northern Lights Singers greet runners with song along on the side of Shore Road during the race. 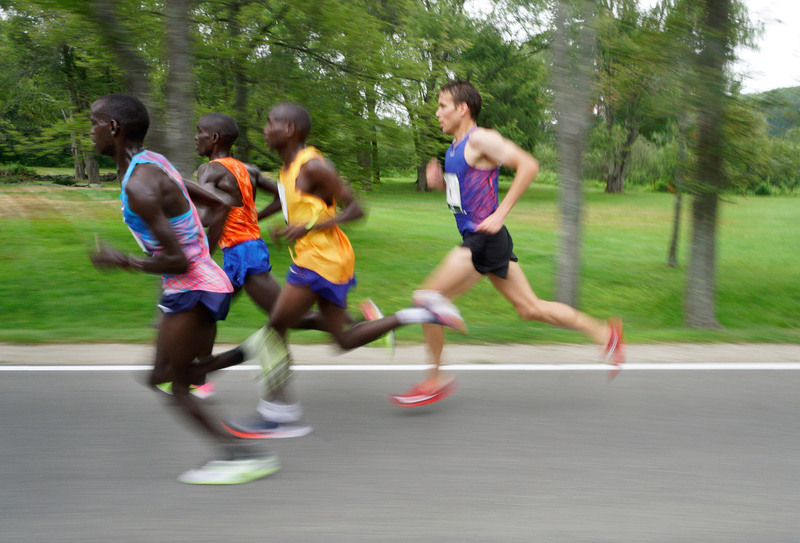 The legs of the lead pack of elite men's runners are a blur. 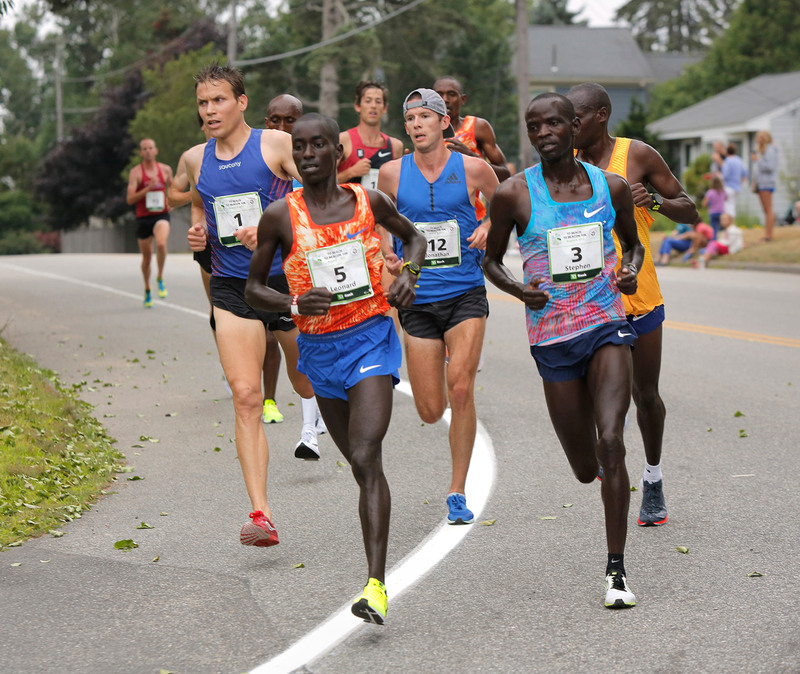 From left are Stephen Sambu, Leonard Kiplimo-Barsoton, Stephen Kosgei Kibet, all of Kenya, and Maine native Ben True. Kibet won the race with Ben True close behind him in second place. 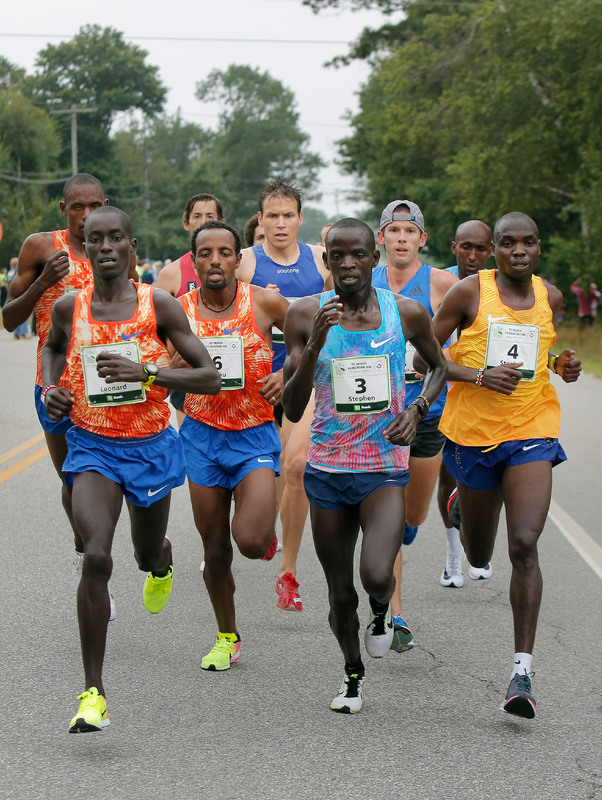 Stephen Kosgei Kibet, 30, at right wearing #4, runs with the elite pack. 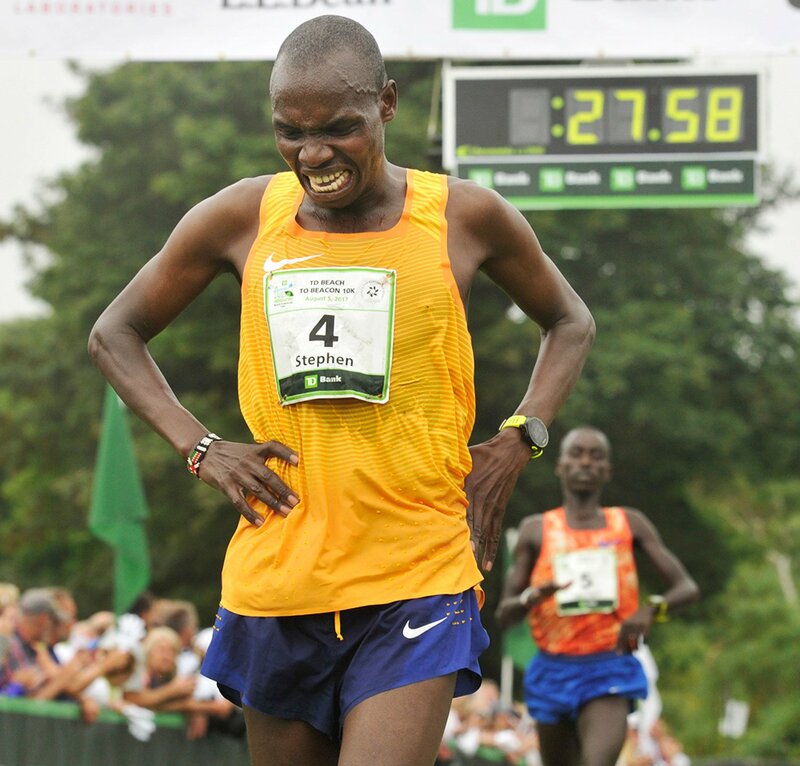 Kibet was the ultimate winner, and he also won the race in 2015 and placed second in 2014. 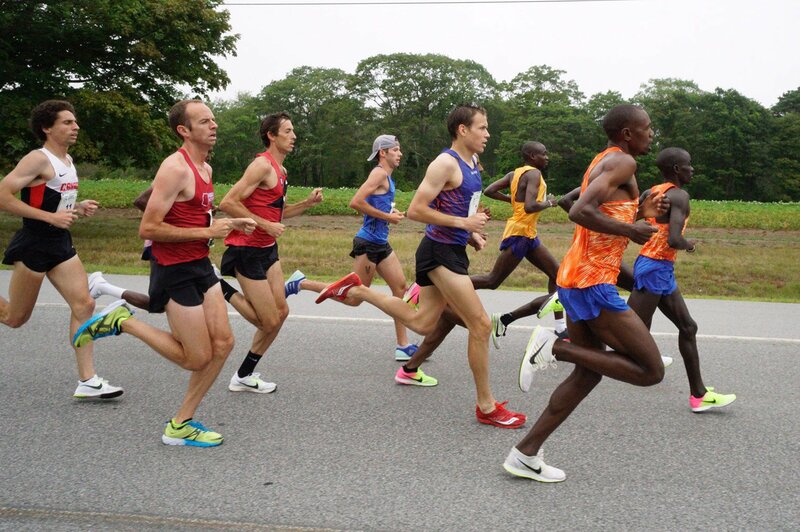 Ben True, a North Yarmouth native, at far left wearing #1, runs with the lead pack of elite men as they turn on to Old Ocean House Road in Cape Elizabeth. True, who won last year, placed second this year. 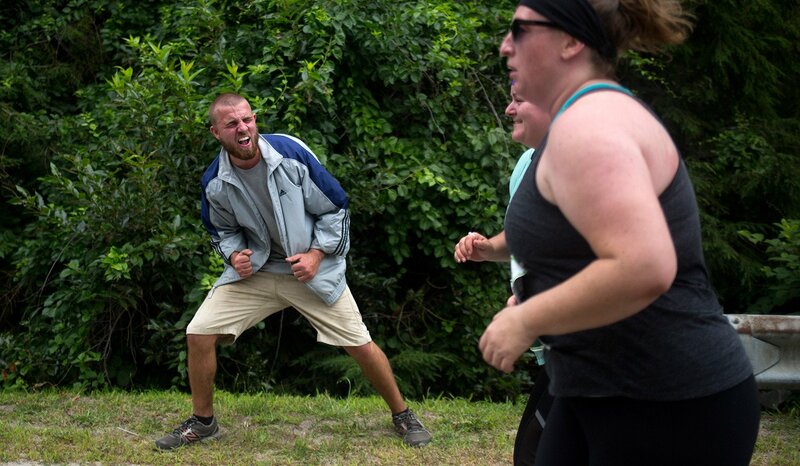 Matt Aceto, of Scarborough, yells encouraging sentiments to runners from the sidelines during the race. 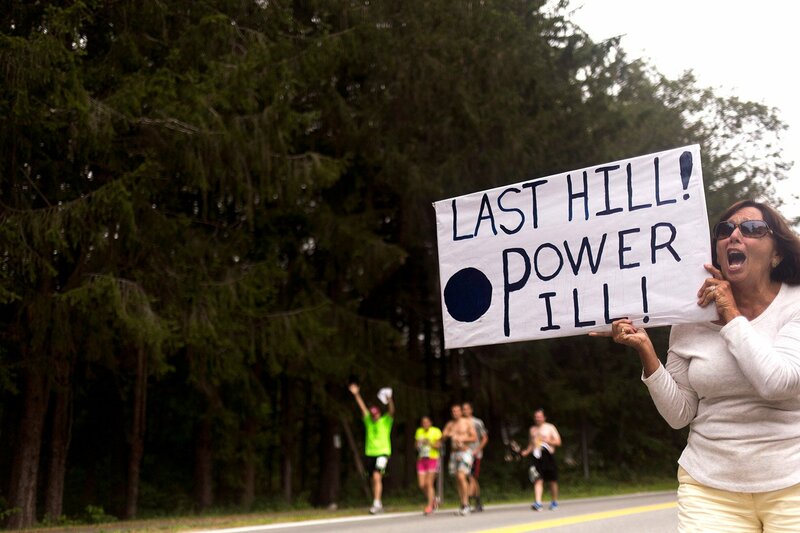 Meg Robinson, of Cape Elizabeth, encourages runners as they climb their last hill before entering Fort Williams Park. 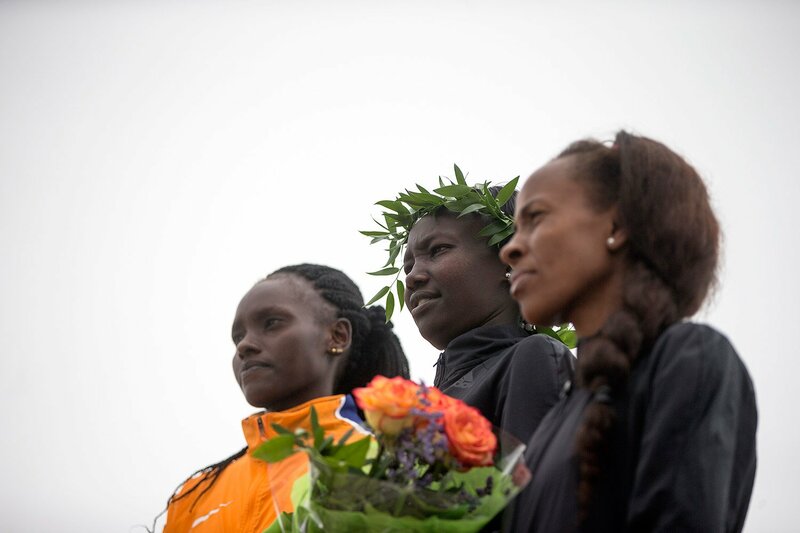 Purity Rionoripo, of Kenya, finished in second place for the women. 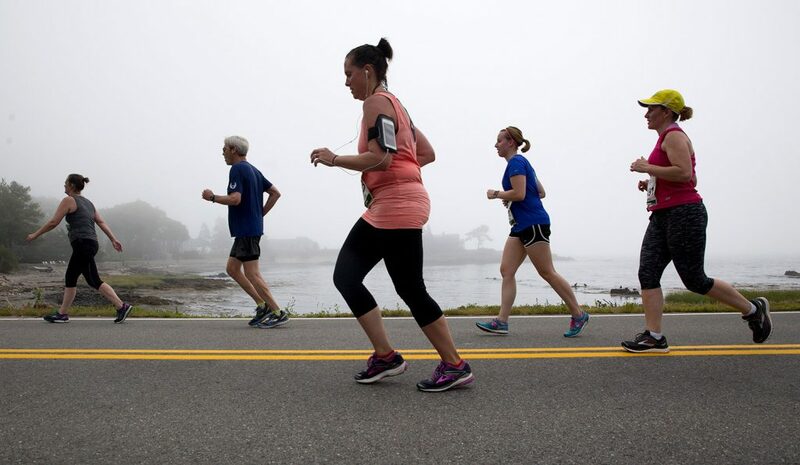 A foggy Pond Cove provides a backdrop for a group of runners on Shore Road in Cape Elizabeth. 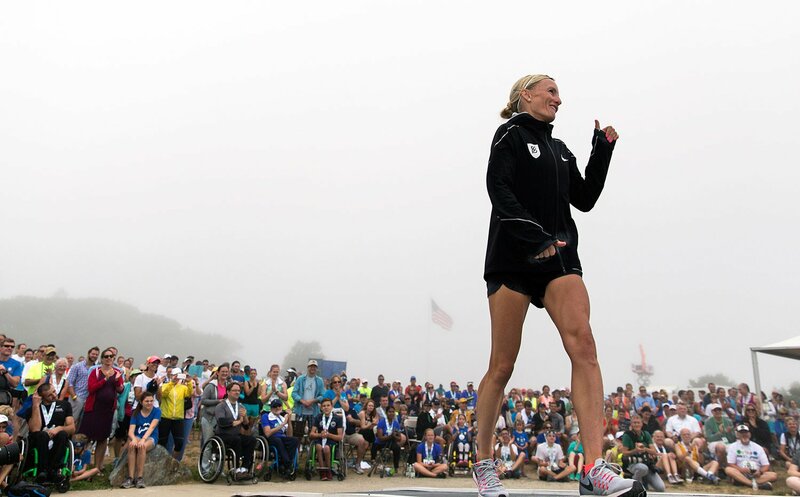 Jordan Hasay is silhouetted against a foggy Pond Cove as she nears the five-mile marker. Beach to Beacon winner Stephen Kosgei Kibet catches his breath after his win. 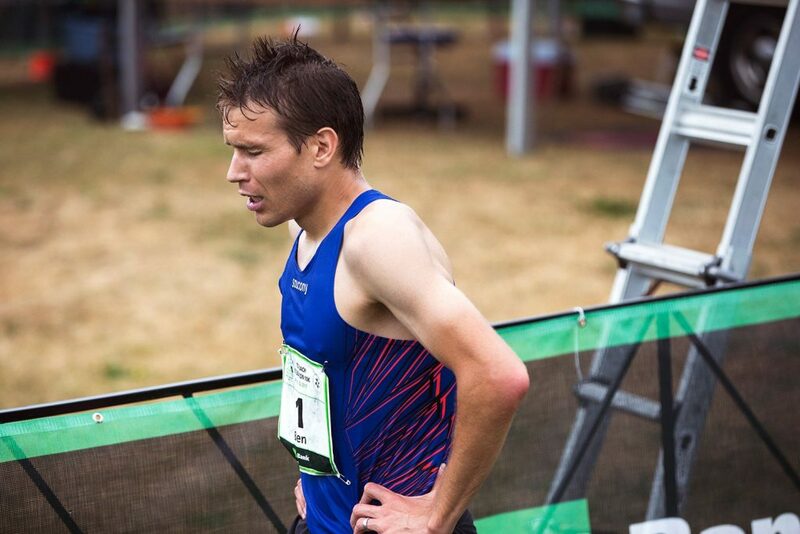 North Yarmouth native Ben True catches his breath after a second-place finish at the 20th running of the TD Beach to Beacon 10K road race. 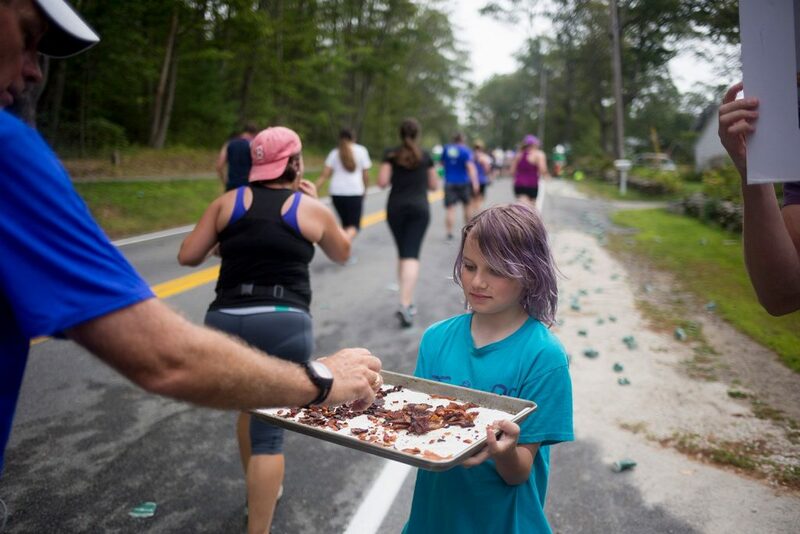 James Voltz, 11, hands out bacon to runners at his neighbor's house on Shore Road during the race. 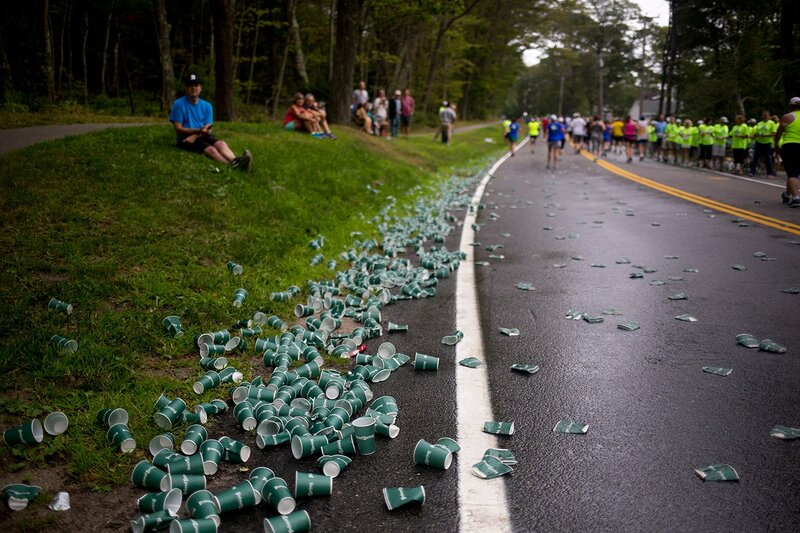 Water cups litter the sides of Shore Road toward the end of the race course.